Welke As mogelijkheden zijn er? Zowel bij de MTB als ook bij de race fiets zijn er diverse as mogelijkheden. Met name de racefiets of gravelbike met schijfremmen hebben andere assen dan de traditionele racefiets met velgrem. Hieronder een goede beschrijving van de verschillende mogelijkheden met hier een daar een toevoeging. I did a quick write up on axle standards so more posters can understand how they work and what they would need if they plan on changing their fork or wheels. There are more standards out there than just the ones I’ve listed, but this will cover the most common ones. I also didn’t cover road bike spacing because that adds unnecessary complexity. On wheels you can’t change the axle type your fork uses without replacing the lowers, or replacing the fork altogether. On rear wheels, you need to make sure your frame and wheels are compatible. 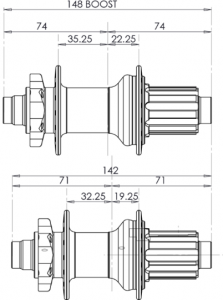 Many hubs are convertible to different axle types using various adapters. Maybe this thread will get sticked so more posters see it. Here the different types of DT Swiss axles. Through Bolt (TB) and Through Axles (TA). Many hubs can be changed from one type to another. 20mm Thru Axle: Unlike traditional hubs, in a 20mm thru axle hub the 20mm diameter axle is actually part of the fork. It typically slides through one fork leg, through the hub and into the other fork leg. Width on a 20mm hub is 110mm. 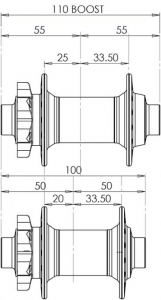 12 or 15mm Thru Axle: A 12 or 15mm thru axle hub is almost identical to a 20mm hub except the axle is 15mm or 12 mm diameter and the width is narrower at 100mm. 9mm QR: A traditional front hub uses a 9mm diameter hollow axle with a 5mm diameter quick release skewer. Forks that accept this type of hub are called “open dropout.” The axle is part of the hub The axle slots into the fork dropout from the bottom and the quick release is used to clamp it in place. Spacing is 100mm. For some hubs it is possible to replace the QR with a 9 mm Trough Bolt (TB). This makes a much stiffer connection between fork and wheel. You only need to replace the endcaps of the hub for 9 mm endcaps instead the 5 mm QR endcaps. Sram introduceerde in 2015 de PS naaf die alleen in een speciale PS vork past. Testen hebben uitgewezen dat de rijeigenschappen van deze vork enorm tegenvallen. Het ziet er mooi uit maar het biedt weinig voordelen. Door de opkomst van de + size banden (27,5+, 29+) is de behoefte onstaan voor een wat bredere naaf waarbij de spaakhoek wat groter wordt waardoor deze wielen meer stijfheid hebben. Boost heeft een voornaaf met een afmeting van 110 x 15 mm. Ook hiervoor is een speciale vork nodig waar deze naaf in past. 142 x 12: 142 x 12 thru axles are all the rage now. Spacing on these is 142mm wide with an axle diameter of 12mm. They essentially operate the same as front thru axles, on the rear of the bike. 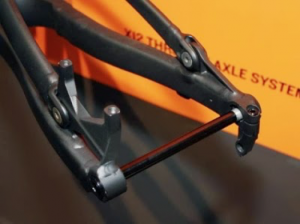 Thru axles make the bike stiffer which reduces lateral flex and results in better tracking especially through corners and at speed. 135 x 12: Before 142mm width hubs became the norm, some manufacturers used the 12mm thru axle with a 135mm width. 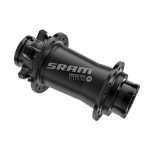 135 x 10: The long time standard for rear hubs was 135mm width with a 10mm diameter hollow axle and a 5mm quick release. Again, the axle is part of the hub. This works on frames with open dropouts only. Many bikes sold still use frames with open dropouts. but with a removable 10mm axle that combines the skewer and axle into one unit. The DT Swiss RWS skewer is a prime example. 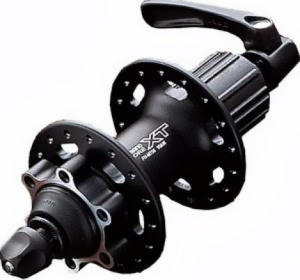 On a similar note, some hub manufacturers offer axle conversion kits that replace the stock axle with one that uses bolts instead of a quick release, like Easton Havoc wheels, or Chris King fun bolts. 150 x 12, 157 x 12: Most downhill bikes use wider hub spacing for a stronger wheel build. 150mm width with a 12mm axle is most common. Many newer DH bikes use 157mm spacing with a 12mm axle. 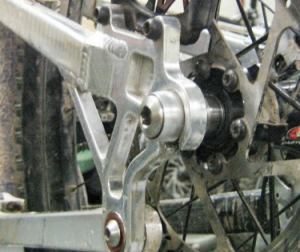 Bolt on: Bolt on axles are found on many department store bikes, but aren’t very common on mountain bikes. 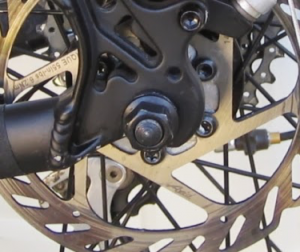 A bolt on axle replaces the hollow axle in a traditional-style hub with a longer, solid axle and uses nuts on either end to clamp it in the dropouts. Spacing remains 100mm on front hubs and 135mm on rear ones. Ook voor de + size banden achter is een boost naaf ontwikkelt die breder is dan de 135 of 142 mm achternaaf: 148 x 12 mm. Ook hier een wat grotere flensafstand voor meer stijfheid in de wielen.